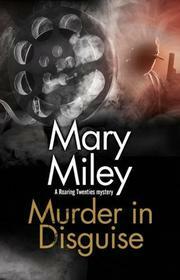 A woman with a shady past continues to prove a capable amateur sleuth. When Barbara Petrovitch’s husband, Joe, is murdered in the movie theater where he serves as a projectionist, she begs Jessie Beckett, who works with her at the Pickford-Fairbanks Studio, to investigate, knowing her success in the past (Renting Silence, 2016, etc.). Douglas Fairbanks agrees to give Jessie some time off, and she soon discovers that Joe, a Serb who sometimes beat Barbara, had a past that was far from an open book. Meanwhile, Helen, one of several women with whom Jessie shares a house, is watching her cousin, Kit Riley, a deaf and mute girl whose mother is off looking for a job. When her mother does not return and sends no word of her whereabouts, Jessie begins to suspect that Kit’s hiding her ability to read lips and, indeed, talk. Jessie’s beau, David Carr, has just been arrested and Jessie testifies at his murder trial. He beats that rap but is convicted on some lesser charges. Jessie and David both have checkered pasts, but she’s now honestly employed, and as far as she knows, David has been successful in selling medicinal alcohol in his drugstores. With a lifetime of background in vaudeville, Jessie, who’s been on her own since she was 12, soon figures out that Joe’s killer escaped by quickly changing his look and calmly walking out of the theater. She finds several other Serbian men who’ve been killed in the same way, shot three times in public, but hasn’t managed to learn why someone wants them dead. When Kit’s mother is found murdered in another city, what Kit has seen and heard in the past go a long way toward helping Jessie solve several crimes. The murders are only the tip of the iceberg in this densely plotted tale. Despite its busy program of felonies, you can’t help cheering on the brave heroine and her young helper, both of whom have faced a life of adversity.